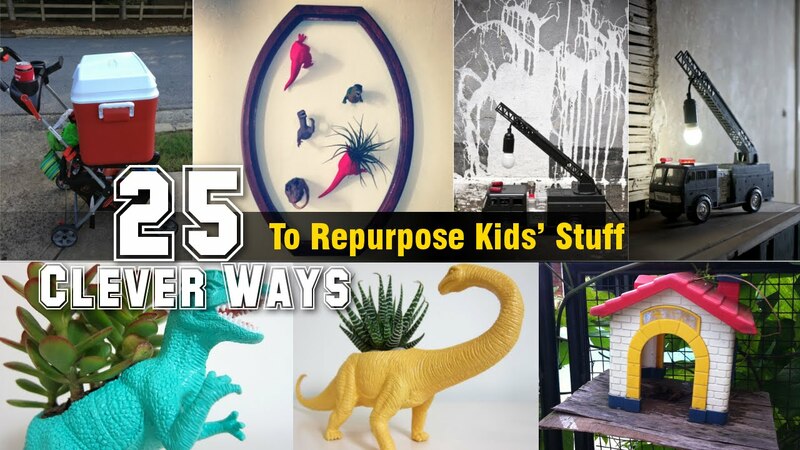 You will be surprised by how fun it is to re-purpose your abandoned kid’s stuff. So if you have unused toys or if your kids have grown up, you should know that re-purposing the leftovers is as fun as playing with them. Read some great toy re-purposing ideas below to get inspirations of how to reuse your old toys. Still related to kids, check this link to find 31 Easy IKEA hacks for your Kid’s room. Lego pieces are as versatile for you as they are for kids. If your kids can think creatively when playing with them, you should also be creative in adult’s way. Almost every Lego piece can be repurposed. Take a Lego minifig hand (part number 3820) and you will know that the hand can firmly hold your USB or Ethernet cable. Take a small Lego plate with hole (3176) and link it to a key so that you can store your key securely by fixing the plate to a large 6×8 Lego plate that you have fixed to a wall. Your baby will leave his/her crib sooner or later. Instead of putting it in a shed, transform it into a versatile desk. Remove one of the long sides (it will be easier if your crib is a drop-side one), put a sheet of middle-density fiberboard on the bed to act as table top, and install hooks on the remaining sides for storage purpose. An unused stroller can also have an obvious use. When your baby doesn’t use it anymore, you can use it as a trolley. A fire truck has a collapsible ladder, doesn’t it? Hang a lamp on its ladder and it will change into a collapsible table lamp. It can be a versatile lamp especially if the ladder can swing sideways. An unused wagon can be used as a portable planter. Fill it with fertile soil and plant anything you want there. You can move out the wagon to give the plant healthy sunray and move it in during heavy storm. Rainbow Loom case is so flexible that it can encase almost everything. Put your smartphone in it to protect it from impact. Folding your sheets and quilts when storing them may create unwanted creases. Therefore, instead of folding them, roll them around a pool noodle to prevent creases. Instead of buying an inflatable beverage float, make one from pool noodles by tying some noodles using a rope that goes through their hollow center and putting them around a basin to let the basin float. The crevice on one side of the pool noodle can be used to hold cards. If you play guitar, a long 8×1 Lego piece (4211008) can be used as capo. The Danish toymaker truly knows how to make a sturdy and functional toy. No one wants to approach a “used” diaper, let alone checking its content. so wrap your valuables in an “unused” diaper to make it look “used” and you are free to go swimming or surfing without worrying about them. Crayon can be as useful as a shoe polish. Shoe polish makes your shoes look shiny and crayon can make dull color more saturated and hide scuffs on leather. You don’t have to think too hard to know that baby bottles can be used as containers for spices and other small items. Just like baby bottles, baby food jars can also be used as storage soon after they are no longer used. Baby food jars are bigger than bottles, making them suitable for containing bigger objects or small objects with bigger quantity. Most toys are hollow. Cut them in half and you will have new planters to plant either real plants or artificial ones. It is fun to see a rose with t-rex bottom, right? What happens to that doll house when the doll leaves it? Well, let the birds move in and settle. An attractive toy house can be a favorite home for your birds. Toy planters can also be fixed to a wall or any vertical surface. Now let those rose-headed t-rexes creep your wall and scare the geckos. Instead of planting flower in your half-cut t-rexes, you can wire a wall lamp on it and make those fearsome lizards even scarier. This is a majestic lamp that you can craft by gluing many toy figurines to a pipe with lamp attached on the top of it. Inside the pipe is the wiring for the lamp. With this configuration, you can make a small shiny monument in your room. Similar idea from different source: beautiful art you can make with $2.99 Goodwill lamp and $8.56 in toys. There is a limit if you want to reuse old kid’s stuff. Kid’s shampoo, for instance, is not for adults. If you try to use it, don’t blame your kid if your hair is blown. Does your mason jar look plain? Glue a plastic toy animal to its lid and the jar will look fancier. If you have small animal figurines, cut their head! Fix the heads to a wooden bar and hang the bar on the wall to make wall-mounted animal head miniatures. The heads function not only as decorations because you can also hang your jewelry on them. If growing plants on a half-cut lizard is not too appealing, find a rubber duck and make a rectangular hole on its back. You can fill the cavity with soil and plant your plant there. You can also do the same to any other rubber toys that you have. Some unused wooden blocks can be reused as hallway hooks by drilling their back and inserting screw in the hole. The blocks can then be attached to the hallway wall and used as hooks.